The Aigle Benyl M is a stylish boot that is great looking and a practical walking boot. It has a new self-cleaning sole with reinforced ribbing for extra grip that is resistant to abrasion. Loved to give this 5 stars but insole does not cover the whole footbed so left with a ridge at the heel which causes a sore heel after walking on it for a while. Putting in an additional half insole solved the problem and gave a better fit in the foot as well. Perfect in all other respects. Can not beat all aspects of Aigle boots. Have the Parcours 2 Vario that have remained in perfect condition for 4 years except for heel wear. So decided to try the Benyl with self cleaning sole and slimmer lighter fit for warmer days. Very pleased. Wouldnt waste money on any other wellie brand because I wear them everyday for long walks with my constant companion (woof son). They are supportive and comfortable on all types of terrains. Wellies had to be reordered a size and a half bigger than shoe size but return was quick and efficient .Returning to a local shop as courier 5 min drive away made return very cheap and efficient. Would use Uttings again wellies very light and comfortable. Durable very comfortable wellie. This is my second pair the first one lasted about 4 years being used almost every day to muck out my horse and only now developing micro cracks which unfortunately let moisture in. They are comfortable even in cold weather due to the softness of the rubber and have a good tread which lasts and can cope with wet clay soil. Purchased to replace another pair that I have had for years. Only reason for giving 3 stars is that the pair delivered were faulty through no fault of Uttings who have been very helpful in arranging a replacement pair at no cost.Top marks for efficiency and amazing customer service. I would certainly shop with them again. Perfect fit have bought these boots before and are extremely well made. This is my second pair the first lasted 10 years of long dog walks. Bought these for my son as have worn Aigle for a number of years and they wear well despite lots of walking over stony and muddy fields. Also very comfortable and possess a strap for tightening at the calf. Last much longer than Hunters! Comfortable yet stylish for wellingtons. Good grip on grass mud etc. Not quite such good grip on slippery stones concrete paths etc. Soft rubber not too heavy for walking in. The only reason this isnt scored as a 5 is because I cant honestly say it exceeds expectations.This is a qood quality product which precisely meets my expectations and matches its cost pro rata to the wellington boot price range of £10.00 up to astronomical.Size wise perhaps a bit on the big size 2 pairs of socks (1 thick 1 thin) are required for a snug fit. Otherwise the boots are easy to put on over thick socks with jeans tucked in I struggled to get into cheaper boots in thin socks without the tuck in.Definitely recommended. Great boots my husband loves them. Look great and comfy when tried on. Yet to put them through their paces though! Lovely boots the most comfortable Ive owned. Bronze is a very dark green colour. The boots are smart comfortable and close fitting but still easy to remove. Ive bought them to go walking in and so far have done a couple of 34 mile walks and the boots have been fine. I bought my actual shoe size 6.5 and have found the boots probably need an extra pair of socks or quite thick socks in order to fit comfortably i.e. they are slightly larger than I expected but this is not a problem. Definitely recommend! Good price and quick delivery what more do you want! Comfy boots which are unusually easy to put on and take off despite a snug fit. Very soft rubber compound a tad soon for me fully evaluate. Will they stand up to dogwalking through the winter...? 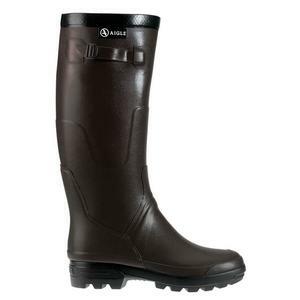 Excellent well fitting Aigle rubber boots which are comfortable and durable. Have had previous pair for 2 years. Worn daily for stable work. Made in France very good quality! Did not fit well. Would have given my husband blisters on his hell if he had kept them as his heel moved up and down when walking. Bad for such well known brand. Aigle wellington are very well made and very comfortable to wear for long dog walks over various terrains. Highly recommended. Very poor quality trying to return them !!! Sadly too large but really nice boots. Quality! Excellent quality great fit ! I had a pair of these boots for 3 years. It had very extensive, daily wear and very comfy to walk around. It was well used in muck, mud, rain and all sorts but finally the rubber gave way - micro cracks appeared where started to leak (not at joinings). Now, I am re-ordering it for the next 3 years as I am happy with it overall. Good light weight wellington boot. Previous pair lasted many years! Ordered these last week as the boots I'd been using when walking the dog weren't up to the job. They arrived last week - plenty of notice re delivery too - a nice touch. The boots are great - very comfortable and well made. Went out in them at the weekend through mud, slime, dirt and water - being dragged about by the dog. The boots passed with flying colours. A definite good buy. Would also definitely use UttingsOutdoors again too - great service. Whether hiking up to remote hill loch for a days fishing or simply walking the dog , these boots remain comfortable all day. Great buy and very much recommended. Comfy, stylish and classy with a very prompt delivery time!! Very good value for money.